Few can have missed the furore over Sir Robert Jones satirical column comments and the NBR being cowed and caving in to the racists’ demands and political correctness by removing the item. But it isn’t going to stop there, it seems. Sir Robert has announced that he is suing Renae Maihi, the organiser of an on-line petition to strip Sir Robert of his knighthood. Sir Robert says that he will be suing for a modest sum – $20,000 – because the principle was what mattered; not the money. If this all comes to pass, it may be an interesting judicial conundrum: just what is and isn’t “hate” speech. Will we soon know? Bob Jones had humour with truth in his eyes. 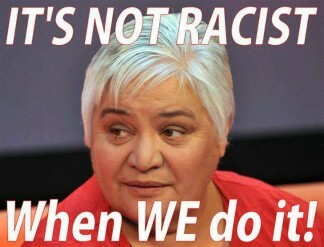 That maori supremacist, part-Maori woman had hatred and intolerance in hers. I wish Bob was 30 years younger as he would make a great PM compared to the dross we have had lately. I agree Bob Jones has the guts that are sadly so lacking in any politicans we have around at the moment. The point he made was perfectly valid and indeed is much the same as the point made on the front of a recent Spectator magazine about Australia in cartoon form. Will we hear any reason at all from current people in politics? – of course not! Many a true word spoken in jest. Couldn’t be more correct. Good on him for taking that stance, hope he wins, but probably won’t with the likes of current attitude. Absolutely we need more people like Bob Jones. People that are not afraid to tell it like it is. I’m really sick of these complainers who look for something to be offended about in every word someone says. If I say I have black tyres on my car, could that be construed as racist and therefor Hate speech. Whatever happened to freedom of speech. Support Bob Jones = he speaks the truth that most NZ know.